FROM: the Offaly Historical & Archaeological Society. The sign on the building reads: “Offaly Exhibition & Research Centre.” It is located at Bury Quay, Tullamore, County Offaly, Ireland:latitude: 53° 16’ 39.18” N; longitude: 7° 29’ 33.08” W. Enter as: 53° 16’ 39.18” N, 7° 29’ 33.08” W.
TO: the cottage in which Major Howard Egan was born and lived as a child, known locally as “Poet Egan’s home” in honor of the last Egan to live there: a poet by the name of Edward Egan. 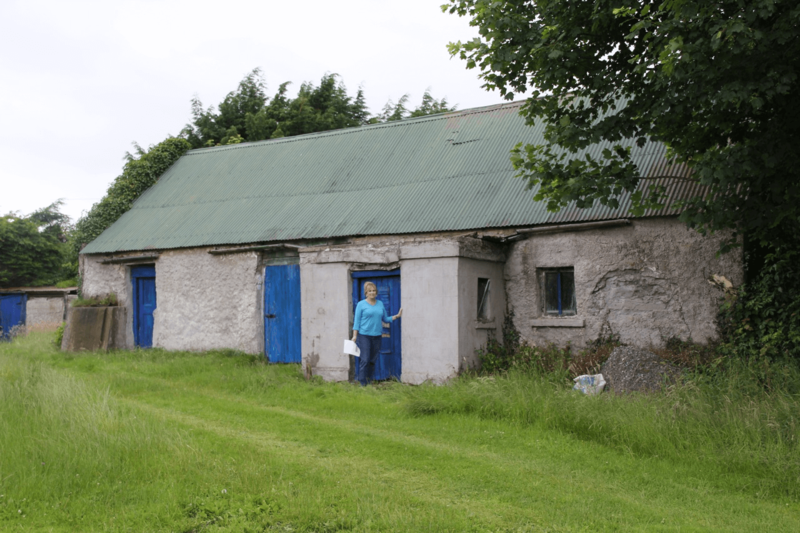 This small, old cottage is located at The Meelahans, Tullamore, County Offaly, Ireland:latitude: 53° 15’ 24.66” N; longitude: 7° 25’ 52.09” W. Enter as: 53° 15’ 24.66” N, 7° 25’ 52.09” W.
2. Head east on Durrow Ln toward Columcille St/R421; travel 184 feet. 3. Turn left onto Columcille St/R421; travel 154 feet. 4. Turn right onto Convent Rd; travel 0.2 miles. 5. Turn left onto Daingean Rd; travel 0.8 miles. 6. 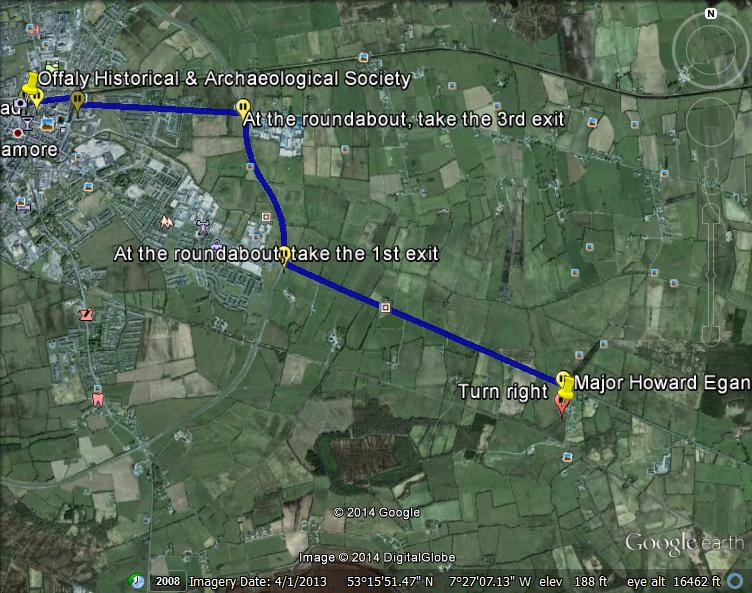 At the roundabout, take the 3rd exit onto N52; travel 0.8 miles. 7. At the roundabout, take the 1st exit onto R420; travel 1,4 miles. 8. Turn right, and in 0.1 miles, the Egan Cottage at The Meelahans, Tulla more, County Offaly, Ireland will be on the right. This old Egan cottage was used as a storage building by the prior owner, Mr. Tom Dunne, now deceased, whose own larger home and barns are on the same property. We have not yet determined who has inherited the property and their intentions regarding the cottage. 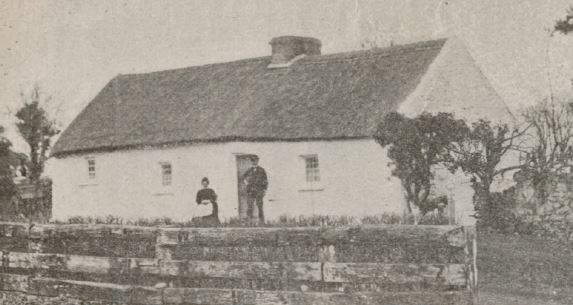 The picture to the left, from the book Pioneering the West, taken prior to 1915, is a photo of the tiny, three-room, thatched roof “cottage” in which Howard Egan was born and in which he lived with 12 other family members until he was 10 years old, when the family emigrated to Canada. 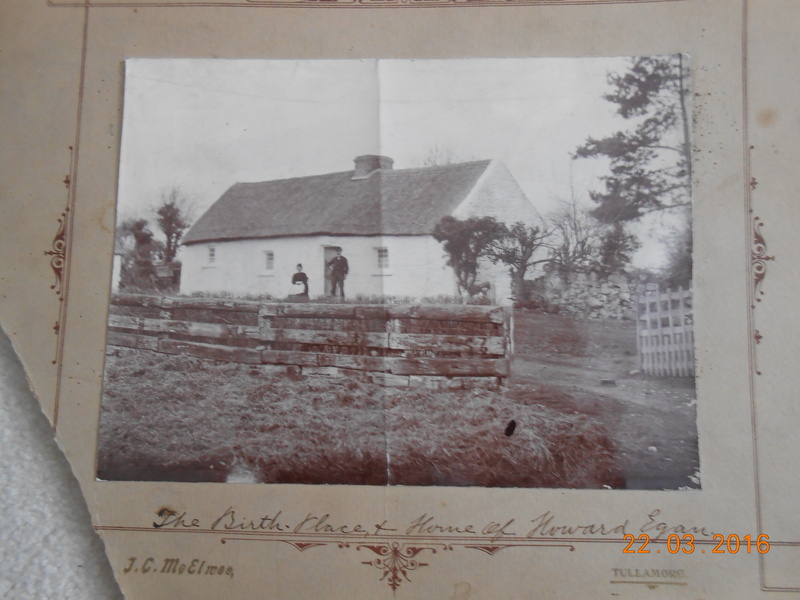 It is believed to have been built by Howard’s grandfather, Bernard Egan, and was a typical rural dwelling of the period. 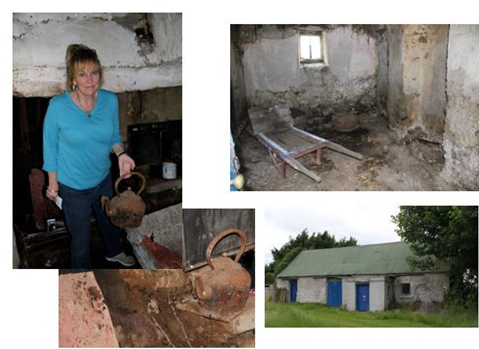 The picture to the right, taken in 2015, shows the cottage in its current state. Over time an enclosed front door porch had been added, two doors had replaced the two windows to the left of the front door, and a corrugated steel roof had replaced the thatched roof and chimney. No chimney was needed after house was converted to a storage shed in about 1941. The last resident of this cottage was Howard Egan’s cousin, twice removed, known locally as “Poet Egan,” who lived there until he died in 1940!! While he lived there it had the same earthen floor, no plumbing, no heat other than the fireplace, and with a roof of thatch! It is believed that Howard’s grandfather built the cottage, but it is unlikely that he owned the land it stood on. The land was inevitably leased from British aristocracy. Every acre would have belonged to Lord Digby. The leases were originally for a thirty-one year period, but later reduced to twenty years.